Aug. 5, 2017 5:40 p.m. The canoe families came to the end of their paddle Saturday at the Tyee Spit in Campbell River. Some had been on the water since mid-July to arrive in time for the celebrations. 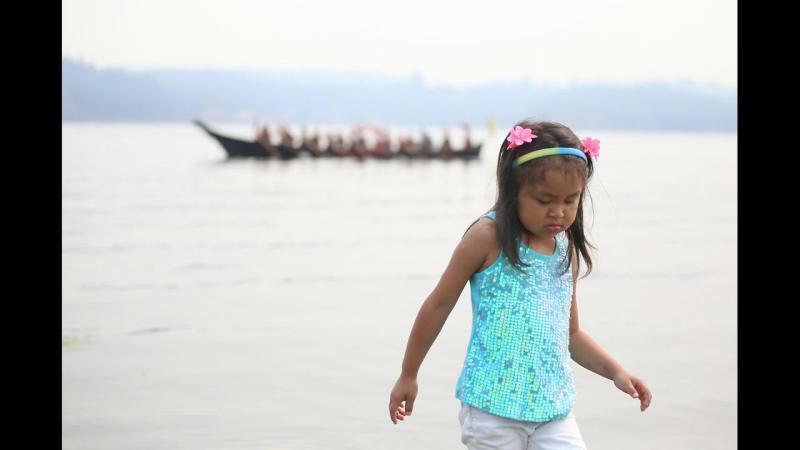 “When the spirit of the canoe calls, you answer that and that’s what brought us here today,” said a member of the Nisqually Tribal Council who participated in the event. Over 100 canoe families made their way from Cape Mudge to Campbell River that morning. Their families, support teams, the local First Nation communities and chiefs, as well as the public, gathered to welcome them. As part of the protocol of welcoming the canoe families to the shore, each got a few minutes to introduce themselves and speak. “This is probably my tenth journey and this has been the most humbling experience I have ever had out here on journeys,” said Todd Delamater of the Chehalis Tribe from Oakville, Wash. The Chehalis canoe family was greeted by a humpback whale as they crossed the border into Canada, and again as they crossed the passage to Campbell River. “We’ve enjoyed all of the beauty that all of you guys have in your lands up here,” Delamater said. Many of the canoe families were made up of people from several different nations, such as the Portland All Nations canoe family. “We are a group of people that is very disconnected from our homelands, so we have come together and travelled from Portland,” the representative for the group explained. The groups spoke briefly of the hardships they faced both on land and on water, but all were grateful they had been successful in their journey and that they were being welcomed on the We Wai Kai and Wei Wai Kum’s traditional First Nations lands. Many young people made the journey, but the oldest paddler was a 79-year-old from Peru who was pulling with the Carvers Camp canoe family. “That’s what these occasions do, they lift up our young people to carry on the things that our colonizers thought we were going to lose and we are bringing it all back together again,” said a representative from the Snuneymuxw First Nation of Nanaimo. The canoe families will be in Campbell River until this Thursday.